Cattle require a minimum amount of water, reflecting the water necessary for growth, fetal development, lactation, and replacing water lost from urine, sweat, and evaporation. An adequate supply of clean, fresh water is a critical component of maintaining healthy, productive livestock. Additionally, knowledge of water needs for livestock is necessary when designing water-supply systems where the water supply may be limited or the delivery system restricts access to water during periods of heavy use. Water is necessary for the majority of life processes, including blood volume maintenance, regulation of temperature, growth, reproduction, lactation, and digestion. In fact, the body weight of mature cattle is about 50 percent water (Johnson et al. 2012). Primary factors known to influence water requirements include age, weight, stage of production, and environment. 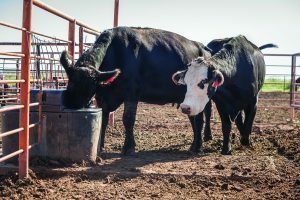 Compared to protein and energy requirements, water requirements and voluntary water intake of beef cattle have not been extensively studied in recent years. For example, water consumption guidelines published in Nutrient Requirements of Beef Cattle (NRC, 2000) were taken from research data published in 1956 (Winchester and Morris, 1956). Considerably more voluntary water consumption and water requirement data are becoming available for growing and finishing cattle, whereas little information is available in published literature for mature beef cows. Current guidelines are restricted to 900- to 1,100-pound mature weight in gestating cows and 900-pound lactating cows only (NRC, 2000). Recent data suggest mature weight in the modern beef cow ranges from 1,100 to 1,500 pounds (Kuehn et al., 2013). Consequently, this publication focuses on estimates of total water requirements for beef cows with varying mature weights at different stages of production and genetic potential for milk production. 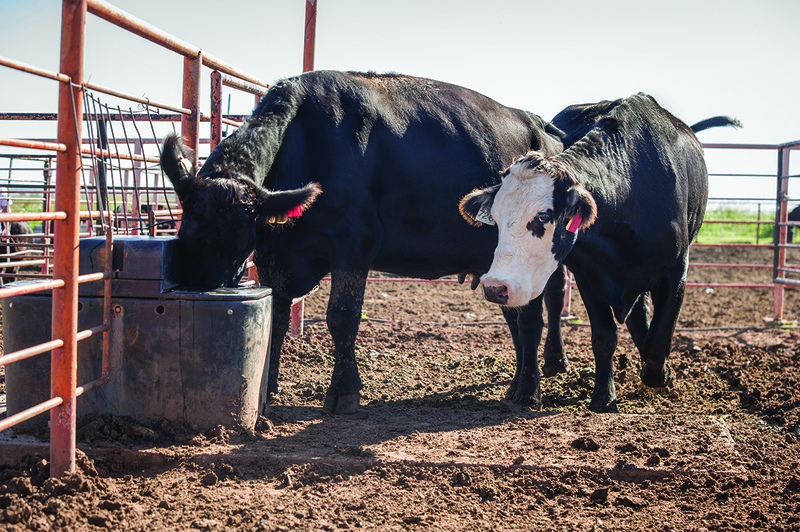 An abundant, clean, fresh water supply is an essential element of a beef cattle production system. During warm months, daily ambient temperature and humidity have a dramatic effect on heat stress and thus water intake in feedlot cattle (Arias and Mader, 2011). These authors reported that a temperature humidity index was the best single environmental indicator of daily water intake. The temperature humidity index is calculated using a combination of the daily average temperature and relative humidity. The Cattle Comfort Index is a similar tool provided through the Oklahoma Mesonet and used to monitor heat and cold stress in cattle (Richards et al., 2012). The Cattle Comfort Index is calculated using ambient temperature, humidity, wind speed, precipitation, and sunlight. The current National Research Council concludes that average daily ambient temperatures below 40 degrees Fahrenheit do not significantly influence water intake. Daily temperature above 40 degrees Fahrenheit, however, increase water consumption linearly (NRC, 2000). For example, water intake was reported to increase by 1.44 pounds per day in lactating dairy cows for each degree Fahrenheit increase in temperature (Murphy et al., 1983), 0.61 pound per day in growing dairy bulls for each one degree Fahrenheit (Meyer et al., 2006), and 0.5 pound per day in feedlot cattle for each one degree Fahrenheit (Hicks et al., 1988). Published research investigating the influence of ambient temperature, humidity, or the combination on average daily water consumption for beef cows is not readily available. Consequently, for this publication, the influence of ambient temperature on water intake was estimated using the approximate mean of the published estimates shown above (0.85 pound of increased water intake per one degree increase in temperature beyond 40 degrees Fahrenheit). Therefore, for every 10 degrees Fahrenheit increase in ambient temperature, an additional one gallon of water should be supplied per animal. Milk composition in beef cows is about 4 percent fat and 8.3 percent other solids (protein, carbohydrates, and minerals; NRC, 2000). Consequently, average water content of milk produced by beef cows is about 87.7 percent. Therefore, lactation has a direct impact on water requirements and water consumption. No publications defining the relationship of milk yield to water consumption in beef cows were found for this publication. Winchester and Morris (1956) concluded that lactating dairy cows consumed an additional 0.87 pound of water per pound of increased milk production. Similarly, Murphy et al. (1983) reported a linear relationship between milk yield and water intake in dairy cows with 0.9 pound of increased water intake for every 1 pound of additional milk produced. Therefore, water intake estimates shown in Table 2 were adjusted by 0.9 pound for each pound of milk produced. The dry matter content of feedstuffs is the proportion of the feed that is not water. Since the water content of forage and feed is extremely variable (Table 1), and because all feedstuffs contain water, feed and forage are important sources of water for beef cattle. Because of this, not all water needs to be provided as free water (drinking water). Compared to dormant pasture, grains, and hay, feeds such as silages and growing pasture are higher in moisture. Nutritional guidelines for beef (NRC, 2000) and dairy (NRC, 2001) cows suggest that consumption of free water declines as the moisture content of feeds in the diet increases. Water intake is highly related to rumen volume and feed dry matter intake (NRC, 2000 and 2001). Greater daily feed consumption is associated with greater rumen volume. Logically, greater mature weight is associated with greater rumen volume and dry matter feed intake (NRC, 2000). Therefore, for the purpose of these water requirement estimates, the influence of cow size and rumen volume on water intake is addressed through the influence of feed dry matter intake. For the estimates presented in Table 2, we assumed that non-lactating beef cows consume an average of 2.2 percent of their body weight and lactating cows consume an average of 2.7 percent of their body weight in dry matter when provided average- or moderate-quality forage. Diets high in protein increase water intake (NRC, 2001). Therefore, early spring forage or high-quality legume silage, for example, is expected to increase water consumption beyond the values shown in Table 2. Conversely, diets at the other end of the quality spectrum also may increase water consumption. While a low-quality diet reduces total dry matter intake, low-quality roughage contains a high proportion of indigestible fiber. Therefore, more moisture is required for additional mucous production to lubricate the digestive tract and move a greater volume of fibrous manure through the large intestine. Diets with a high concentration of salt and other minerals also increase water consumption (NRC, 2001). *1 gallon is equivalent to 8.35 lbs. Table 2 provides estimates of water consumption based on mature cow body weight, average daily temperature, stage of production (gestation or lactation), as well as milk yield. Three levels of milk yield are provided. Zero milk indicates cows that are dry or not lactating. The two levels of milk yield provided for each weight class of cows can be used to indicate differences in genetic potential for milk yield during peak lactation (around 45 to 60 days after calving). The two levels of milk yield also could be used to estimate the difference in milk yield (and thus water intake) from early lactation to the later stages of lactation because milk yield declines as the lactation period progresses beyond peak (NRC, 2000). These estimates for water consumption are intended to represent total daily water consumption. Free water intake could be substantially lower than the estimates presented in this publication when beef cows consume feeds containing considerable moisture. • For each 10 degrees increase in ambient temperature above 40 degrees Fahrenheit, cattle consume about 1 more gallon of water per day. • For each additional gallon of milk produced, cows need to drink an additional gallon of water. • Feeds that are high in moisture contribute to water intake. The dryer the feeds consumed, the more drinking water required. An abundant, clean, fresh water supply is an essential element of a beef cattle production system. Considerable work has been conducted to determine water consumption and factors influencing water consumption for dairy cows, growing cattle, and finishing cattle; however, relatively little research has been published to provide robust estimates for water consumption of beef cows. The estimates of total daily water requirements specific to beef cows in this publication were developed using equations developed by reviewing available published literature. Factors considered in these estimates include mature body weight, feed dry matter intake, milk yield, and average daily ambient temperature. Arias, R.A., & Mader, T.L. (2011). Environmental factors affecting daily water intake on cattle finished in feedlots. J. Anim. Sci. 89: 1: 245-251. Hicks, R. B., Owens, F. N., Gill, D. R., Martin, J. J., & Strasia, C. A. (1988). Water intake by feedlot steers. Misc. publication-Agricultural Experiment Station, Oklahoma State University, Oklahoma. Johnson, I.R., France, J., Thornley, J.H.M., Bell, M.J., & Eckard, R.J (2012). A generic model of growth, energy metabolism, and body composition for cattle and sheep. J. Anim. Sci. 90: 4741-4751. Kuehn, L., Snelling, W., & Thallman, M. (2013). Preliminary estimates of breed differences from recent sampling in the Germplasm Evaluation Project. Proc. Beef Improvement Federation 45th Annual Research Symposium and Annual Meeting, Oklahoma City, OK. June 12-15, 2013. Lanham, J. K., Coppock, C. E., Milam, K. Z., Labore, J. M., Nave, D. H., Stermer, R. A., & Brasington, C. F. (1986). Effects of drinking water temperature on physiological responses of lactating Holstein cows in summer. J. Dairy Sci. 69(4): 1004-1012. Meyer, U., Stahl, W., & Flachowsky, G. (2006). Investigations on the water intake of growing bulls. Livestock Science. 103(1): 186-191. Murphy, M. R., Davis, C. L., & McCoy, G. C. (1983). Factors affecting water consumption by Holstein cows in early lactation. J. Dairy Sci. 66(1): 35-38. NRC (2000). Nutrient Requirements of Beef Cattle (7th Ed.). National Academy Press, Washington, DC. NRC (2001) Nutrient Requirements of Dairy Cattle (7th Ed.). National Academy Press, Washington, DC. Richards, C., Lalman, D., Highfill, G., LeValley, B., & Sutherland, A. (2012). Using the Mesonet cattle comfort advisor. http://www.mesonet.org/images/site/Using%20the%20Mesonet%20Cattle%20Comfort%20Advisor(1).pdf. (Accessed 19 July 2016). Winchester, C. F., & Morris, M. J. (1956). Water intake rates of cattle. J. Anim. Sci. 15(3): 722-740.